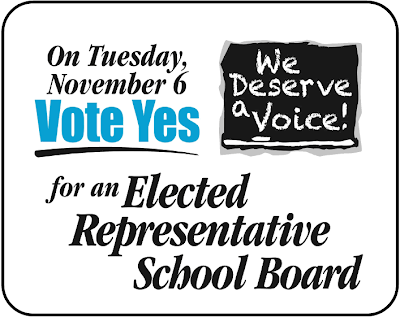 The advisory referendum for an Elected Representative School Board is on the ballot in 327 precincts around the city. Vote Yes! Go to this list to see if your precinct is one of them or view a sample ballot for your precinct based on street address here. You may have to go to the end of the ballot to find the referendum. Vote Yes! Tell your friends and neighbors! Download and post this flyer/palm card. Let voters know. Review the attached list and contact one of the TSJ community partners to distribute flyers and take a shift at a polling place on election day (Nov 6th) so voters know to VOTE YES! for an Elected Representative School Board.